Treat someone or indulge yourself with a pampering Gift Set. Pamper skin with the beautifully packaged soaps that give skin a gorgeous scent. 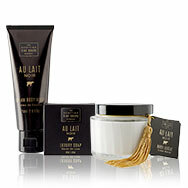 Au Lait is a truly indulgent range of exceptionally nourishing and moisturising products. These pamper products enriched with natural goodness of Organic Milk and blended with a range of enhancing ingredients; Shea Butter, Cocoa Butter and Vitamin E. Your skin will be left beautifully soft. 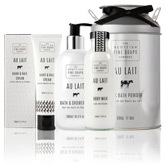 Created to celebrate 20 years of Scottish Fine Soaps best selling line Au Lait, the Au Lait Noir scent is a sophisticated version of the original fragrance. With alluring notes of light musk, sandal and florals, this luxurious bodycare range envelops the skin with a nourished, soft feel. 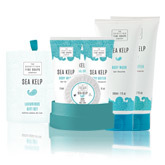 Recreate the spa experience with the invigorating Sea Kelp enriched with fresh, coastal fragrances. 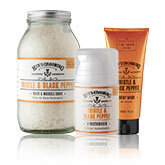 Men's Thistle and Black Pepper Collection soothes, hydrates and energises skin with a spicy, woody fragrance. 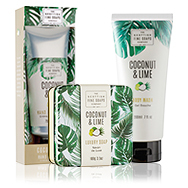 Enriched with nourishing coconut oil, this luxurious collection from Scottish Fine Soaps will leave skin hydrated and radiant. 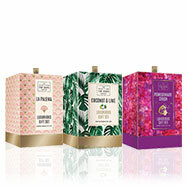 With a zesty tropical scent, these beautifully natural cleansing products are sure to become a firm favourite. 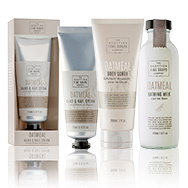 This pure and gentle range is formulated with natural oat milk and coconut oil. 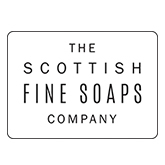 View all Scottish Fine Soaps products all in one place. Scottish Fine Soaps was established in 1974 by Derek Ross, and was set up as a family business near Central Scotland. With the vision to become a “superb toiletry manufacturer” Derek made this the core of the business, they continue to this day to focus on this idea, whilst embarking on their new vision at the same time “to create exquisite aromatic Bath and Body products”. Their products promote well-being for the mind and body whilst providing a luxury, pampering experience. Using a gorgeous blend of ingredients along with Scottish style to create both bath and beauty collections, with the intention to make you feel, look and smell fantastic. Over the last 40 years Scottish Fine Soaps have been searching, not only Scotland but the globe for inspirational ingredients. All of Scottish Fine Soaps products are created, designed and packaged at their factory in Ochil Hills in Stirlingshire. Their team consists of production specialists, and designers, along with an in-house chemist, meaning all their products are overseen through testing and quality control. 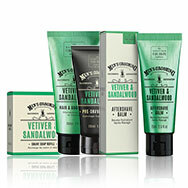 Scottish Fine Soaps grooming products now come in gift sets as well. As Scotland’s natural environment is so beautiful, Scottish Fine Soaps have made it their mission to not only provide only quality products, but to maintain this beauty. Being Carbon Trusted Certified since 2010 proves how committed they are. Scottish Fine Soaps Tangled Rose Hand and Nail Cream – this must have hand and nail cream is the perfect addition to your handbag! Leave your hands and nails feeling nourished and hydrated, whilst having super-soft skin. With its small size, its perfect to have on the go, for fresh, gorgeous smelling hands, all day long! Scottish Fine Soaps Sea Kelp Body Butter – a nourishing body butter, which leaves skin feeling moisturised, and uplifted, whilst smelling refreshing. Scottish Fine Soaps Mens Grooming Eau de Toilette – a masculine scent, enriched with notes of black pepper sea buckthorn, sandalwood, men can’t be without. This beautiful scent will leave you feeling fresh and clean, ready to take on the day!